2000 PhD, Economics, University of Auckland. 1995 MCom (First Class Honours), Economics, University of Auckland. Rhema is a Professor in the School of Economics at AUT and Co-Director of the Centre for Social Data Analytics (also within the School of Economics). She is a highly experienced researcher with a focus on health economics. Rhema has secured funding for, and led, numerous large international research projects involving multidisciplinary research teams, including the Singapore Life Panel and development of the Allegheny Family Screening Tool. She is known for her ability to design research that delivers important academic and translational outputs. Rhema’s research interests include: Applying economic theory to health care funding, policy research focused on understanding and improving the way health and human services work (including work on indigenous health and disparities) and predictive analytics and predictive risk modelling research focused on the methodologies, implementation and implications of predictive risk modelling in health and social services settings. Predictive risk modelling has been Rhema’s main research focus since 2014, including a number of translational projects in the United States. Rhema is regularly invited to share her work, advise and collaborate, with researchers, agencies, government officials and funders working in the health and human services sectors in New Zealand, the United States, Australia, Europe and the United Kingdom. Allegheny Family Screening Tool – Rhema led an international research team to develop a predictive risk modelling tool to assist child welfare call screening decisions in Allegheny County, Pennsylvania. Douglas County Decision Aid – Rhema is leading the infrastructure development of the Douglas County Decision Aid – a predictive model to be used during child welfare call screening in Douglas County, Colorado. Unlike the Allegheny Family Screening Tool, the Decision Aid does not rely on fully integrated data. It will be implemented as a randomised controlled trial. HEE Wessex “My Day” Survey – Rhema is leading a study of the experienced wellbeing of junior doctors in Wessex, England during their workday, using an online survey tool named “MyDay”. Allegheny County Homelessness Predictive Risk Model – This project is developing a predictive risk model to assist Allegheny County to prioritise interventions for people who are at a heightened risk of chronic homelessness. Singapore Life Panel – Rhema is the Director of the Singapore Life Panel at Singapore Management University, which asks Singaporeans aged 50-70 years about their income, expenditure, health, work and housing choice. 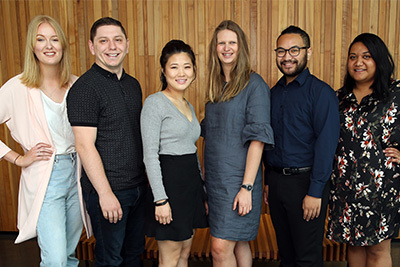 Growing Up in New Zealand – This project is using the Growing Up in New Zealand dataset to identify the most important protective individual, family and neighbourhood factors for children who have multiple at-birth risk factors for an adverse childhood experience. An Ethical Framework for Social Policy Applications of Predictive Analytics– This Marsden funded project aims to produce a set of practical guidelines for the ethical use of predictive analytics across a range of policy applications. See the Centre for Social Data Analytics Newsletter for the latest information about Rhema and CSDA’s work. Cheng, T., Li, J., & Vaithianathan, R. (2018). Monthly Spending Dynamics of the Elderly Following a Health Shock: Evidence from Singapore. Health Economics, 28(1), 23-43. Vaithianathan, R., Hool, B., Hurd, M. D., & Rohwedder, S. (2018). High-frequency internet survey of a probability sample of older Singaporeans: The Singapore life panel. The Singapore Economic Review, 1842004. Reid, P., Paine, S., Te Ao, B., Vaithianathan, R., Willing, E., & Wyeth, E. (2018, June 19). Estimating the Economic Costs of Ethnic Health Inequties: Protocol for a Prevalence-Based-Cost-of-Illness-Study in New Zealand (2003-2014). BMJ Open, 8(6), 1-7. Rouland, B. & Vaithianathan, R. (2018). “Cumulative Prevalence of Maltreatment Among New Zealand Children, 1998–2015”, American Journal of Public Health, 108(4), 511-513. Vaithianathan, R., Rouland, B. & Putnam-Hornstein, E. (2018). “Injury and Mortality Among Children Identified as at High Risk of Maltreatment”, Pediatrics, 141(2). Cuccaro-Alamin, S., Foust, R., Vaithianathan, R. & Putnam-Hornstein, E. (2017). “Risk assessment and decision making in child protective services: Predictive risk modelling in context”, Children and Youth Services Review, 79. Maloney, T., Putnam-Hornstein, E., Vaithianathan, R., Jiang, N. & Dalton, E. (2016). “Black–White Differences in Child Maltreatment Reports and Foster Care Placements: A Statistical Decomposition Using Linked Administrative Data”, Maternal and Child Health Journal. Ryan, M. & Vaithianathan, R. (2015). "The Regulation of Direct‐to‐Consumer Advertising of Pharmaceuticals in a Managed Care Setting", Journal of Public Economic Theory, 17(6), 986-1021. Dare, T., Vaithianathan R., & De Haan, I. (2014). "Addressing child maltreatment in New Zealand: is poverty reduction enough?" Educational Philosophy and Theory, 46(9), 989-994. Linthicum, M. T., Thornton Snider, J., Vaithianathan, R., Wu, Y., LaVallee, C., Lakdawalla, D. N., Benner, J. E., & Philipson, T. J. (2014). "Economic Burden of Disease-Associated Malnutrition in China" Asia-Pacific Journal of Public Health, DOI: 1010539514552702. Lewis, G., Vaithianathan, R., Bardsley, M. et al. (2013). “How Well Are Virtual Wards Integrating Care for High-Risk Patients? A Three-Site Case Study”, International Journal of Integrated Care. Vaithianathan, R., Maloney, T., Jiang, N. & Putnam-Hornstein, E. (2013). “Using Predictive Modelling to Identify Children in the Public Benefit System at High Risk of Substantiated Maltreatment”, American Journal of Preventive Medicine. Lewis, G., Vaithianathan, R., Wright, L., Brice, M. R., Lovell, P., Rankin, S. & Bardsley, M. (2013). “Integrating care for high-risk patients in England using the virtual ward model: lessons in the process of care integration from three case sites”, International journal of integrated care, 13. Lewis, G.H., Kirkham, H., Duncan, I. & Vaithianathan, R. (2013). “How Health Systems Could Avert ‘Triple Fail’ Events That Are Harmful, Costly and Result In Poor Patient Satisfaction”, Health Affairs 32(4), 669-676. Lewis, G., Wright, L. & Vaithianathan, R. (2012). "Multidisciplinary case management for patients at high risk of hospitalization: comparison of virtual ward models in the United Kingdom, United States, and Canada. ", Population health management, 15.5, 315-321. Dale, C., Feng, F., & Vaithianathan, R. (2012). “Microfinancing in Developed Economies”, New Zealand Economic Papers, 46(3), 303-313. Mills, C., Reid, P. & Vaithianathan, R. (2012). “The Cost of Child Health Inequalities in Aotearoa New Zealand: A Preliminary Scoping Study”, BMC Public Health, 12, 384. Gilbert, A., Hockey, P. & Vaithianathan, R. (2012). “Perceptions of Junior Doctors in the NHS about their Training: Results of a Regional Questionnaire”, BMJ: Safety and Quality, 21(3), 234-8. Gørgens, T., Xin, M. & Vaithianathan, R. (2012). “Stunting and Selection Effects of Famine: A Case Study of the Great Chinese Famine”, Journal of Development Economics, 97(1), 99-111. Ryan, M. & Vaithianathan, R. (2011). “Verifiability and Neologism-Proofness in a Sender-Receiver Game”, Journal of Economic Behavior and Organization, 79(3), 256-262. Vaithianathan, R., et al. (2011). “Recruit with caution, manage with care.” British Journal of Healthcare Management, 17(12), 579-583. Pannatoni, L., Vaithianathan, R., Ashton, T. & Lewis, G. (2011). “Predictive Risk Modelling in Health: Options for New Zealand and Australia”, Australian Health Review, 35, 1-7. Rigotti, L., Ryan, M. & Vaithianathan, R. (2011). “Optimism and Firm Formation” Economic Theory, 46(1), 1-38. Lewis, G., Vaithianathan, R., et al. (2011). “Counter Heroism, Common Knowledge and Ergonomics: Concepts from Aviation that Could Improve Patient Safety”, Milbank Quarterly, 88(1), 1-48. This was the lead article and was cited in The New York Times (op-ed, April 7, 2010) and WSJ (online blog). Chesnokova, T. & Vaithianathan, R. (2010). “The Economics of Female Genital Cutting”, B.E. Journal of Economic Analysis and Policy (Topics), 10(1), Article 64. Vaithianathan, R. & Lewis, G. (2010). “NHS as an Insurer”, Journal of Health Services Research and Policy, 15(3), 171-173. Vaithianathan, R. (2010). “Building on Myths”, New Zealand Medical Journal, 123(1314), 79-83. Vaithianathan, R. et al. (2009). “Iatrogenic Effects of COX-2 Inhibitors in the US Population”, Drug Safety, 32(4), 335-343. Vaithianathan, R. (2009). “An Economic Critique of Urban Motorways: The Case the Waterview Connection in Auckland”, Road and Transport Research, 18(3), 86-90. Chesnokova, T. & Vaithianathan, R. (2008). “Lucky Last? Intra-Sibling Allocation of Child Labor”, B.E. Journal of Economic Analysis & Policy (Advances), 8(1), Article 20. Vaithianathan, R. & Lewis, G. (2008). “Operational Independence for the NHS: Applying the Theoretical Framework of the Central Banks to Healthcare”, British Medical Journal, 337, 809. Vaithianathan, R. (2007). “Better the Devil You Know than the Doctor You Don’t”, Journal of Health Services Research and Policy, 11(4), 235-239. Vaithianathan, R. (2006). “Health Insurance and Imperfect Competition in the Health Care Market”, Journal of Health Economics, 25(6), 1193-1202. Vaithianathan, R. (2004). “A Critique of the Private Health Insurance Regulations in Australia”, Australian Economic Review, 37(3), 257-270. Vaithianathan, R. (2003). “Supply-Side Cost Sharing when Patients and Doctors Collude” Journal of Health Economics, 22(5), 763-780. Ryan, M. & Vaithianathan, R. (2003). “Medical Insurance with Rank-Dependent Utility”, Economic Theory, 22(3), 689-698. Ryan, M. & Vaithianathan, R. (2003). “Adverse Selection and Insurance Contracting: A Rank-Dependent Utility Analysis”, B.E. Journal of Theoretical Economics (Contributions), 3(1), Article 4. Vaithianathan, R. (2002). “Will Subsidising Private Health Insurance Help the Public Health System?”, Economic Record, 78(242), 277-283. Vaithianathan, R. (1999). “The Failure of Corporatisation: Public Hospitals in New Zealand”, Agenda, 6(4), 325-338. Chouldechova, A., Putnam-Hornstein, E., Benavides-Prado, D., Fialko, O. & Vaithianathan, R. (2018). “A case study of algorithm-assisted decision making in child maltreatment hotline screening decisions”, Proceedings of Machine Learning Research, 81, 1-15. Vaithianathan, R., Putnam-Hornstein, E., Jiang, N., Nand, P. & Maloney, T. (2017). “Developing Predictive Models to Support Child Maltreatment Hotline Screening Decisions: Allegheny County Methodology and Implementation”. Data Futures Partnership Working Group (2017). “A Path to Social Licence: Guidelines for Trusted Data Use”, Data Futures Partnership. Vaithianathan, R., Maloney, T., Wilson, M., Staneva, A. & Jiang, N. (2017). “Impact of School-Based Support on Educational Outcomes of Teen-Mothers: Evidence from New Zealand’s Teen Parent Units”, Ministry of Social Development. Vaithianathan, R., Maloney, T., Wilson, M. & Joyce, S. (2017). “Family start impact study: Selected extensions”, Ministry of Social Development. Wellington. Vaithianathan, R., Wilson, M., Maloney, T., & Baird, S. (2016). “The impact of the family start home visiting programme on outcomes for mothers and children: A quasi-experimental study”, Ministry of Social Development. Wellington. Vaithianathan, R. (2001). “An Economic Analysis of the Private Health Insurance Incentive Act (1998)”, CEPR Discussion Paper No. 427, Research School of Economics, ANU. Lewis, G. H., Georghiou, T., Steventon, A., Vaithianathan, R., Chitnis, X., Billings, J. & Bardsley, M. (2013). “Analysis of virtual wards: a multidisciplinary form of case management that integrates social and health care”, Final report, NIHR Service Delivery and Organisation programme, 150-8. Vaithianathan, R., Maloney, T. & Jiang, N. (2012). “Vulnerable Children - Can Administrative Data Be Used to Identify Children at Risk of Adverse Outcomes?”, Ministry of Social Development. Aoki, R. & Vaithianathan, R. (2009). “Is Demeny Voting the Answer to Low Fertility in Japan?”, Institute of Economic Research, Hitotsubashi University, Japan. Gørgens, T., Xin, M. & Vaithianathan, R. (2007). “Stunting and Selection Effects of Famine: A Case Study of the Great Chinese Famine,”, IZA Discussion Paper No. 2543, Institute for the Study of Labor (IZA), Germany. Maani, S., Vaithianathan, R. & Wolfe, B. (2007). “Inequality and Health: Is Housing Crowding the Link?”, La Follette School of Public Affairs, University of Wisconsin-Madison. Hurley, J., Vaithianathan, R., Cobb-Clark, D. & Crossley, T. (2001). “Parallel Private Health Insurance in Australia: A Cautionary Tale and Lessons for Canada”, CHEPA Discussion Paper No. 01-12. Rigotti, L., Ryan, M. & Vaithianathan, R. (2001). “Entrepreneurial Innovation”, Department of Economics Working Paper E01-296, UC Berkeley.